A 22-year-old inmate firefighter injured by a falling boulder during a brush fire Thursday in Malibu has died, according to the California Department of Corrections and Rehabilitation. 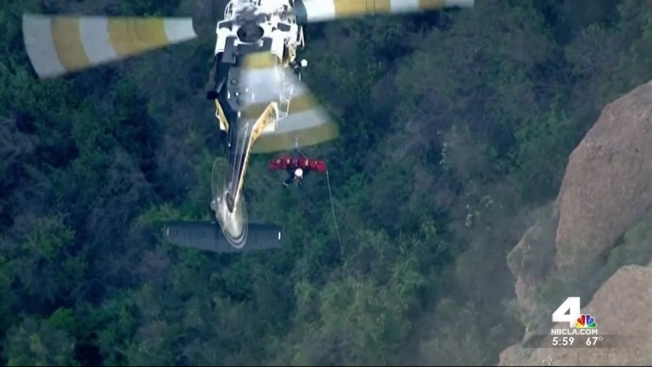 The member of an inmate camp crew was helping with the firefight when she was struck in the head by a rock and hospitalized with "major injuries," according to the Los Angeles County Fire Department. A helicopter rescue team airlifted the crew member out of the canyon. Shawna Lynn Jones, 22, died at a hospital Friday, according to the California Department of Corrections and Rehabilitation. The boulder rolled down the hillside and struck Jones in the head during the 10-acre fire near Mulholland Highway and Pacific Coast Highway, according to the department's statement. "Her death is a tragic reminder of the danger that inmate firefighters face when they volunteer to confront fires to save homes and lives," said CDCR Secretary Scott Kernan. "On behalf of all of us in the department, I send my deepest condolences to her family." Shortly after the announcement of her death, the Los Angeles County Sheriff's Department sent personnel to Leo Cabrillo State Park, near the site of the fire, for a death investigation. The sheriff's department handles investigations involving deaths of jail inmates, according to a spokeswoman for the agency. Jones is the third inmate firefighter to die on a fire line since the camp program began in 1943, according to the department. Female inmates became part of the program in 1983. Fire camp crew members receive special training from the fire department to help with fire suppression and other emergencies. The California Department of Corrections and Rehabilitation selects inmates, non-violent offenders, to join CalFire and local crews across the state. The Corrections and Rehabilitation Department has 44 conservation camps. Jones, a Los Angeles County Jail inmate, joined the program in August 2015. She was assigned to the Malibu camp, which is operated in partnership with Los Angeles County. No structures were damaged in Thursday's fire.